Thu, Mar 21, 2019, 11:02 am SL Time, ColomboPage News Desk, Sri Lanka. Mar 21, Colombo: Sri Lankan banks have been able to manage the capital impact of first-time adoption of SLFRS 9 accounting standards, in line with Fitch Ratings' expectations, due to capital infusions ahead of full implementation of Basel III, satisfactory profitability buffers and the four-year phasing-in period, Fitch Ratings says. Sri Lanka adopted SLFRS 9 on 1 January 2018, but banks were permitted to follow the older accounting standard, SLAS 39, in calculating credit costs until end-2018. Two banks reported credit costs under SLFRS 9 at end-3Q18; the rest moved to SLFRS 9 in their end-2018 statements. The local regulator has allowed banks to spread the one-time impact of SLFRS 9 implementation over four years for the purpose of calculating regulatory capital ratios. This reduces pressure on banks to raise capital over and above the equity they have already raised (LKR50 billion in 2017 and LKR24 billion in 2018) in preparation for full implementation of Basel III on 1 January 2019. Twelve of the 16 local Fitch-rated banks have now disclosed the day-one impact of SLFRS 9 in their 2018 financial statements, based on their end-2017 balance-sheet position. Their aggregate opening loan loss allowances increased by LKR32 billion, or 27%, from the end-2017 position. This translates to a reduction in their regulatory capital ratio of about 50bp-60bp on average. Eleven of the 12 banks could have met the Basel III capital ratio requirements in full at 1 January 2019, even without the permitted capital benefit from deferring the SLRFS 9 impact. 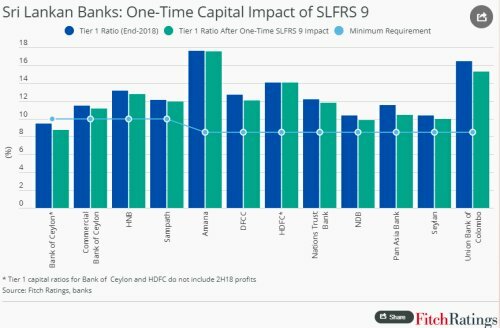 Bank of Ceylon (BOC) had the highest one-time impact from SLFRS 9 among the domestic systemically important banks (D-SIBs). The impact of 0.9% of risk-weighted assets would have reduced its Tier 1 capital ratio below the 10% minimum requirement for D-SIBs, if applied in full to its Fitch-estimated end-2018 capital ratio. People's Bank has not yet released its end-2018 financial statement and is therefore not included in the chart. We estimate that the day-one impact of SLFRS 9 may also reduce its Tier 1 ratio to just under 10%, based on our analysis of its end-3Q18 disclosures. However, the four-year phase-in should help to keep both BOC and People's Bank just above the minimum regulatory ratio.